An imposing Federal house on the west side of Route 40 between Speigletown and Melrose is home to Paradise Tree Service and( formerly) The Other Side of Paradise. I have always heard it referred to as the old Brookins home, though I knew nothing about Mr. Brookins. There is a small cemetery on the same side of the road, just north of the home where “Colonel” James Brookins and his wife Mary Taft are buried, along with two of their sons, Kasson and Wooster. Who was this “Colonel” who built such a grand house around 1800 in a relatively undeveloped area? Fortunately, Brookins’ wife, Mary Taft Brookins filed for a military pension after the death of her husband. The pension papers reveal a lot about their history. James Brookins was born in New Marlboro, in Berkshire County, Massachusetts in 1747, apparently a younger child in a huge family. He and Mary married in 1771 in that town. When the Revolution began, they lived in Poultney, in what would become Vermont after the war. Perhaps James had already been involved in the local militia, as many men were. He joined Ethan Allen’s Green Mountain Boys, and participated in the taking of Ticonderogaon May 10, 1775. Ethan Allen and Colonel Benedict Arnold and a small group of Allen’s Green Mountain Boys took Ticonderoga by surprise, capturing the cannons which were so vital to the fledgling US Army at the siege of Boston the next spring. General Knox and his men laboriously moved those cannons from Ticonderoga to Boston through the winter, crossing the Hudson River near Half Moon. There is a Knox Trail marker in Mechanicville. Brookins went on to serve as a Lieutenant in the Regiment commanded by Colonel Ebenezer Allen at Pittsford, Vermont, and then as a Captain in the Vermont State Troops stationed at Castleton,Vermont for two years. At the time of the battle of Bennington- that attempt by Burgoyne, the British army, and its Hessian allies to get supplies during the invasion of New York in the summer of 1777- Mrs. Brookins and her friends fled back to her old home in Berkshire County. After the battle, Captain Brookins retrieved Mrs. Brookins and took her back to Poultney. For the rest of the war, he led scouting parties from Castleton, ranging all the way up Lake Champlain to Canada. 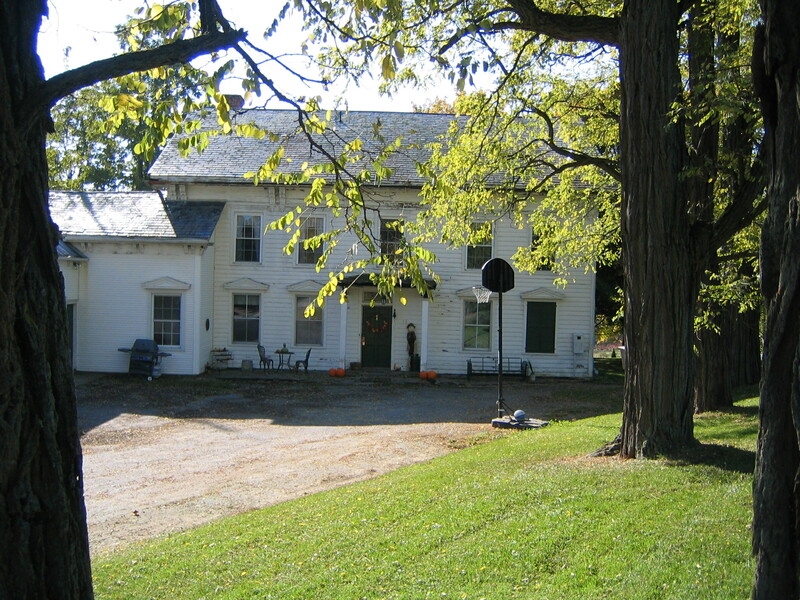 In 1793, the Brookins moved to Schaghticoke with at least their two sons, Wooster, born in 1778, and Kasson, born in 1790. A document created after Brookins’ death lists the following children: sons Wooster, Alanson, Kasson, and James, and married daughters Clarissa Pratt, Purly Gardner, Polly Rich, and Sally Turner. It does not include any dates of birth for them, however. Only Woosterand Kasson are buried in the cemetery with their parents. Wooster died in 1856 and Kasson in 1854. On Mrs. Brookins’ tombstone, her husband is referred to as “Colonel” Brookins, a rank he never achieved. Once James Brookins reached Schaghticoke, his biography became more difficult for me to piece together. Deed research in the Rensselaer County Court House revealed that in November, 1792, he purchased 185 acres of land along the main road from Martinus Weatherwax for 600 pounds. It was next to the farm formerly of Alexander Weatherwax. I wrote about the Weatherwax family in earlier columns. On March 1, 1797, Brookins was listed as licensed to keep an inn or tavern The tavern was probably just a room in his home. When the Northern Turnpike Company was formed in 1800, James Brookins was one of the five commissioners. This indicates both his desire for a better road in front of his property, and his ability to make an investment in it. I wrote about the Turnpike in an earlier column. By 1800, Brookins was one of the ten wealthiest men in town, with real estate worth $5,147 and a personal estate of $166. Brookins was also one of the five original investors in the Rensselaer Cotton and Woolen Mill in 1810. This was one of the first industrial enterprises based on the water power of the Hoosic River in Schaghticoke. Brookins and four others paid $9000 for about 30 acres of land on the Hoosic Riverat Schaghticoke between a grist mill and a cooper shop, including all “edifices, ways, water courses…, mills of every kind, all utensils, etc” from the heirs of Joseph Klein. James Brookins died in 1826, his wife Mary in 1836, the year she filed for his Revolutionary War pension. Unfortunately, examination of James Brookin’s will reveals a sad ending to his seemingly successful life. Brookins’ personal estate was insufficient to pay his debts, so his real estate was seized so that enough of it could be sold to pay them off. Perhaps the reason for the indebtedness was at least in part that the Rensselaer Cotton and Woolen Mill was bankrupt by 1819. In May, Michael Vandercook, sheriff of the county, had to sell the mill to pay off about $6000 in debt. The highest bidder, William Howard of New York City, only paid $2,025. An 1828 document in Brookin’s probate file is Mary Brookins “petition for Dower”. As a widow, she was entitled to 1/3 of her deceased husband’s land and premises. Three “disinterested freeholders” were appointed by the judge to measure and lay off that amount. She even was to receive 1/3 of the house to live in, specifically “the front center room of the first floor, the bedroom and pantry in the rear of that room, and the chamber above those rooms.” A long inventory of the contents of the house and barns includes a wagon, pleasure sleigh, lumber sleigh, fanning mill, eight platters and six silver spoons, to begin with. It goes on for four pages. The most expensive items on the list were the wagon, valued at $15, and the fanning mill, valued at $12. Brookins’ probate file also contains copies of advertisements which his son,Wooster, executor of the estate, placed in the local newspapers in 1829. Several advertised the sale of some of Brookins’ property in April of that year, the original 185 acres less 70 acres already sold to Wooster. Interestingly, one of the supposed “disinterested freeholders,” Stephen Germond, of Speigletown, purchased the land for $1200. Another clipping advertised that the monies from the sale of Brookins’ property would be distributed that July, urging his creditors to come forward. The file also includes a bill from Wooster to the estate for everything from “27 years service…$3000” to “coffin…$13.” Perhaps by billing his father in this way,Woostermade sure of his inheritance. Another bill from Dr. Timothy Cone , lists 74 visits he made to Brookins during the last year of his life, at $1.50 per visit. It was in these documents that I discovered the list of Brookins’ children, all heirs of the empty estate. The information on Brookins’ Revolutionary War service came from the application his widow Mary made for a pension, necessary now that she was impoverished at his death. The file did not include a list of Brookins’ creditors, which would certainly have added to the story. The inventory of the estate did not reveal a lavish life style. The most expensive furnishings of the home were several feather beds and bed steads. Perhaps the investment in failed Woolen and Cotton Mill was just too much for him to handle. In any event, it is an interesting tale of an early pillar of the Schaghticoke community. I thought it might be interesting to follow the story of Wooster Brookins, the executor of his father’s estate. He was a bachelor farmer who continued to live on part of his father’s property. He served in the county militia, where he was listed as a 1st Lieutenant in Herman Knickerbocker’s troop of Cavalry in 1804. Wooster is listed as one of the early school commissioners in the town of Schaghticoke. He was Town Clerk of Schaghticoke in 1813 and Supervisor from 1816-1817. So while father James was investing in industry and roads, his son was very influential in the political life of the town. At that point the boundaries of the town changed, the Deep Kill became the southern boundary of Schaghticoke, and Wooster now lived in Lansingburgh, a much bigger and more urban area. He was one of the original managers of the Rensselaer County Agricultural Society in 1819,and signed a testimonial in its publication, “The Cultivator,” in 1845, attesting to the excellence of I.T. Grant’s (of Grant’s Hollow) Fan Mill. This indicates he must have been prominent not only in the town, but in the county, a person whose stamp of approval was desirable to sell this product. In the 1855 census, Wooster Brookins was listed as a 77 year old farmer. Also living in his home were his housekeeper, a widow named Margaret Ash, aged 59, and John Bennet, a 22 year old listed as a farmer, probably Wooster’s farm help. I don’t know who two other people in the household were: Pealy Black, a 54 year old widow fromVermont, and James Chambernice, a local 14 year old. Perhaps James was a farm hand, and Mrs. Black an old acquaintance of Brookins, who himself had originally come fromVermont. His farm had 200 improved acres, 50 unimproved. The land was valued at $15,000 and the livestock at $1600. In 1855 the farm produced 60 tons of hay, 100 bushels of winter wheat, 150 of oats, 250 of rye, 100 of corn, 20 of potatoes, and 100 of apples, plus 5 barrels of cider. There were 23 cows, 4 oxen, 3 cows, 1 cow slaughtered for meat, 3 cows milked with 400 pounds butter produced, 3 horses, and 9 pigs. Wooster was a bachelor, and when he died in 1856 was able to leave about $1500 to each of his surviving siblings, James, of Aurora, New York; Polly Rich, of Ogden, NY,; Purley Gardner of Canandaigua, NY; and Sally Turner of Canton, Illinois. Their locations are a good illustration of the migration of people west from our part ofNew York. Woosteralso left about $500 each to several nieces and nephews. Wooster Brookins also left an inventory of his estate, which, unlike his father’s, includes animals and crops. There was one hog, worth $19.68; a pair of cattle, $151.30; 16 sheep, $75; 1 34-year-old horse (! ); 2 red cows, $40; 1 grey horse, $150; and 20 steers, 2 years old; $500. In crops, he left 11 tons of hay, 200 bushels of corn, 420 bushels of oats, 100 bushels of rye, and 10 acres of sowed rye. Brookins also had twenty shares in the Rensselaer County Bank, valued at $850. The inventory goes on to list in detail all the furnishings of the house and barn, plus the contents of the pantry, with no one item worth more than $12. How did Woosterend up solvent and more, while his father was bankrupt? We can only speculate. At least we can enjoy reading the inventories of these men James, the Revolutionary War veteran, who inflated his rank from Captain to “Colonel”, and Wooster, the bachelor son, who left a diversified farm. Miller, Richard, “Patroons of Modernization: The Economic Elite ofRensselaerCounty”, 1986. Military Minutes of the council of Appointment of NYS, vol 1. Sylvester’s History of Rensselaer County,1880. In previous posts, I discussed the early textile industries on the Hoosic River at thevillage of Schaghticoke. They used the tremendous water power of the falls at that spot. One of the early mills in the town had nothing to do with textiles and was located on a different body of water: the black powder mill begun in 1812 on the Tomhannock Creek, just west of where it is crossed by Route 40. The mill was begun by members of the Masters family to provide black powder for the U.S. Army during the War of 1812. In this post, I will outline what I have learned about the beginnings of a very famous local industry, the powder mill, and about two members of the Masters family: James and Josiah. The first Masters to come to Schaghticoke was James (1731-1820). Like Bethel Mather, whom I wrote about recently, James was one of the many New Englanders who moved west and north following the American Revolution, looking both for better farmland and for industrial opportunities. He and wife Eunice (1738-1795) and their five children arrived from near Fairfield,Connecticut in 1783. I think it took ambition and initiative for a middle-aged man and wife and a large family to pick up and move with the Revolution barely over and the new country not really established. Plus, James was not a poor man seeking his fortune. He was able to purchase a tract of land two miles square on the north bank of the Hoosic River, at the junction of current Masters Street and Ridge Road. He built his first home in six weeks, later adding a “mansion”, plus grist, saw, and woolen mills, a school house, and a family cemetery. Most of the estate, known as St. Croix Farm, stayed in the Masters family until at least 1880. James immediately became involved in local government, serving as one of the two Overseers of the Poor in the brand new town of Schaghticoke in 1789. James’ youngest son, Josiah (1764-1822) came to Schaghticoke a bit after the rest of the family. He arrived in 1784, after his graduation from Yale. There would have been very few college-educated people in Schaghticoke at that time. Josiah married three times. His first wife Eunice died in 1789, days following the death of their newborn son. They were the first burials in the Masters family cemetery. Josiah and second wife Lucy Hull had seven children. She died in 1816. Josiah then married Ann Smith, by whom he had two more children. Nicholas (1759-1838) and James (1761-1828) were James’ other sons. Both also became involved in the community. Nicholas and Josiah both served as early school commissioners. All were involved in the organization of the first Masonic Lodge, the Homer Lodge, organized in 1799. Josiah was the first Master. James and Josiah were two of the initial subscribers to the Presbyterian Church in 1803. Josiah and Nicholas both bought pews when the church was moved in 1820, and Nicholas was an early elder of the church. When the War of 1812 with Great Britain began, New York State, with its border with Canada, was one of the most exposed states. Much of the fighting in the war occurred on the borders of New York and Canada. The Governor of the State was Daniel D. Tompkins, like Josiah Masters a Democratic-Republican. Tompkins was a very active war governor, spending much of his own fortune to finance war preparations- and then finding that New York was not good at repaying its debts (what a surprise!). He died destitute in 1825. In 1812, Josiah, probably along with his brothers James and Nicholas, built a mill on the Tomhannock Creek, west of where it crosses Route 40, to produce gun powder to supply the U.S. Army. There are several theories as to why they were authorized to build the mill. According to Anderson in Landmarks of Rensselaer County, President Madison and Governor Tompkins separately and together used their personal influences with the Masters to secure the establishment of the mills. Kloppott, in her History of Schaghticoke, turned it around, stating that Madison and James Monroe prevailed upon the Governor to name the Masters to build the mill. Masters would have met them while a Congressman in Washington,D.C. It seems to me that whatever the reality, political influence was used. And it makes more sense to me to think that the Masters wanted to build the mill and used political “pull” to get permission. But political influence didn’t result in a boondoggle. The Tomhannock was a site well-situated for water transportation of the product on the Hudson River. It was close to the new Watervliet Arsenal, but rather isolated in case of explosions, and there was no other source of munitions supply between New York City and the Canadian border. So far I have not found any early record of the powder manufactured there. The powder mill remained in the Masters family until 1836. The community of Schaghticoke Hill grew up around the mill. There was a keg factory, a grist mill, a saw and turning mill, all using the power of the Tomhannock. There was also a store, and a blacksmith shop, a school house, and a Methodist church. Herman Knickerbocker, whom I will write about in future posts, had a textile factory and a home on the Tomhannock as well. Powder mill operations gradually moved to a site on the Hoosic River in ValleyFalls in the second half of the 19th century, and the company eventually became part of Dupont Powder. Many local residents know the story of its periodic explosions, and the final explosion in 1928, resulting in the death of four workers and the closure of the mill. In later posts, I will tell its story more fully. But now, I will continue the history of the Masters family. The Masters were also farmers, Josiah the Congressman on a grand scale. Josiah died at age 58 in 1822, while visiting his home town of Fairfield,Connecticut. Perhaps due to his unexpected death, and due to its size, his estate was not finally settled until 1834. He left a will, but the papers connected with settling the estate occupy two fat folders in the probate records. Earlier, I stated that father James acquired a plot two miles square when he came to town in 1783. 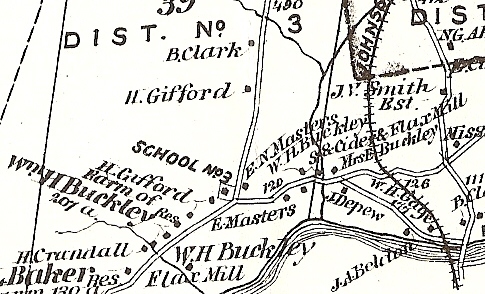 A map in the probate file shows four contiguous farms along what is nowMasters Street. Josiah had just sold a farm of 125 acres his father left him in 1820 to John D. Dickinson. Next door was the “Manchester Farm,” about the same size, which had already been sold, as well as Josiah’s own “Grass Farm,” about 100 acres, and the farm of his brother James, about 60 acres. Josiah also had a large farm in Stillwater. When father James died in 1820, at age 89, he owned a modest amount of livestock: one yoke of old oxen, one bay mare, eleven sheep, and seven cows. Presumably he would have been mostly retired from farming. But Josiah, dying in the prime of his career, left 325 sheep, four yoke of oxen, 30 cows, 40 hogs, and ten hives of bees. Prominent local attorney- and fellow former Congressman- Herman Knickerbocker was executor of the estate, along with the widow. The inventory of his estate, made by Bethel Mather and Munson Smith, a brother-in-law, was literally ten feet long. The estate sale took two days. It seems that everything was sold, and that Josiah’s widow Ann and her children had to buy what they wanted of the family belongings. The Masters lived in high style. The fact that the house James built once he had established himself in town was called “The Mansion” tells us that. Morgan Lewis, who was Governor of N.Y. just before the War of 1812 and Quartermaster General during the war, wrote to his wife from Troy in February, 1815. He described a “grand entertainment at Judge Masters’…for the Officers of the Army. It consisted of 60 gentlemen and ladies who dined with him and were entertained with a ball in the evening, all in handsome style. A great part of the company stayed to breakfast the next morning, and I have seldom been at a pleasanter party. The women were generally very handsome and dressed as well as the ladies of any of our cities.” Would you be able to entertain sixty people at a dance at your home, accommodate most of them for the night, and feed them breakfast the next morning? Not to mention that they would have arrived in horse drawn vehicles, so that the horses would have had to be tended to. And this was in February, at a period when the roads in the area would have been very primitive. The Masters must have had formidable resources. I would have liked to have been there! After their deaths, inventories were made of the estates of both father James and son Josiah. James, who died in 1820 at the age of 89, was very much an 18th century man. His inventory includes basic furniture, dishes, and cooking utensils. The most valuable items were a looking glass worth $6.50, 12 linen and cotton sheets, valued at $15, and a feather bed, worth $12. He owned a watch worth $6.50 and his wearing apparel was valued at $46. Interestingly, James’ sons Nicholas and Josiah each owed him over $2,000 when he died. Perhaps this was a way for him to distribute some of their inheritance before his death. Josiah had many more belongings, including many yards of carpeting, a 26-volume set of an encyclopedia plus about 25 other books, a “blue dining set” of dishes worth $30, a gold watch worth $35, five silver teaspoons, four maps, a coach worth $27, and “an electrical machine” worth $2. Who knows what that was? His apparel was only valued at $30. The inventory even included the contents of his pocket when he died: $5.25 and a New York City lottery ticket, which won $10. It also included powder mill supplies and products, and the statement of the open accounts there. Sixty-five men owed from less than a dollar to about $150 to the mill. This would indicate that Josiah owned the mill. Josiah’s probate records also include details of the expenses of his widow Ann between the date of his death and the final settlement of the estate in 1835. Ann was Josiah’s third wife. They had been married after the death of second wife Lucy in 1816. Ann and her young two children by Josiah, Justus, and Ann Margaret went to live in Hamilton,N.Y., her home town, after Josiah died.. She had a very cordial correspondence with her brother-in-law, Nicholas, as they worked to settle Josiah’s estate and take care of his other children. . He reported on doings in his family, for example, reporting that his grandsons John and Edward were in school in Benningtonin 1834. He also asked in 1831, “we are anxious to learn whether Justus has yet regained the use of his limbs.” We don’t know the answer to that, but Justus survived at least until the settlement of the estate in 1835. Josiah’s eldest daughter Eunice was married to Charles Stebbins and lived in Cazenovia. Eldest son Samuel, born in 1801, was advanced $40 when he left home for Boston after his father’s death. He received another $50 in 1823. I will devote later writings to Samuel, who became the first U.S. Counsel to the island of Guam. Josiah had four teenage children, all in boarding school. Between 1822 and 1825, son Augustus received $500 for his support. The accounts record constant payment for room and board for daughters, Eliza, Louisa, and Ianthe, as well as their doctor and clothing bill. Josiah’s brother Nicholas managed their accounts for his sister-in-law, Ann, who paid about $100 per year for the support of Ianthe, and $200 each for the other girls. The probate file also yields the detail that James Mallory of Schaghticoke went to Fairfield to retrieve Josiah’s corpse in 1822, at a cost of $30; that the funeral expenses in Connecticut were $150; that it cost Ann, her children, and her servant $25 to get home from Connecticut; and that the grave monument, not purchased until 1832, cost $25. Josiah was buried in the family plot, next to the Mansion House on Masters Street. Most of the other documents in the Josiah’s probate file involve the business of his farms on Masters Street and in Stillwater, including bills for cutting and hauling logs, harvesting crops, building stone and wood fences, and blacksmithing. There are receipts for crops sold: buckwheat, rye, corn, hay, oats, butter, and wool, and for rents collected on houses, including the Mansion House itself, rented first to Henry Burch, then to Dr. Newcomb. Other receipts were for subscriptions to the local newspaper and an agricultural magazine called “The Ploughboy.” Finally, there is a note of the sale of the farm in Stillwater. Many of these transactions and others were handled by Herman Knickerbacker, fellow former-US Congressman and prominent local attorney, as executor. In the end, he wasn’t happy with the Surrogate’s settlement of the estate, though from the available documents, I can’t tell why. He submitted detailed bills for his travel around the area, usually $4 per trip for the rental of a horse and wagon, plus bills for his actual work as executor. The Masters family story illustrates the prosperity of the country following the American Revolution. Father James was a wealthy New Englander when he moved his large family to New York, seeking more land. He plunged into the local community. His ambitious and educated son Josiah entered politics, performing for a while on the national stage. He used his political connections to boost his Powder Mill, founded to help in the first war fought by the new Republic. Josiah also had extensive farms, and kept up with the latest in agricultural improvements. His political connections probably helped his son Samuel in his own diplomatic career. Judge Masters died a wealthy man, having lived a cosmopolitan life, controlling business and farms, while prominent in county politics. Bibliography: Anderson, George, Landmarks of Rensselaer County, 1897. Biographical Directory of the US Congress, p. 1274. Lane, Anne Kelly and David McMahon Peril in the Powder Mills, 2004.